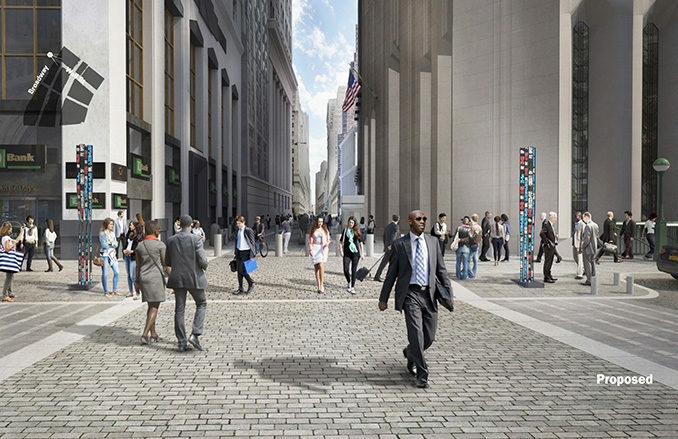 The Alliance for Downtown New York has released a report to make the New York Stock Exchange District be more pedestrian friendly. 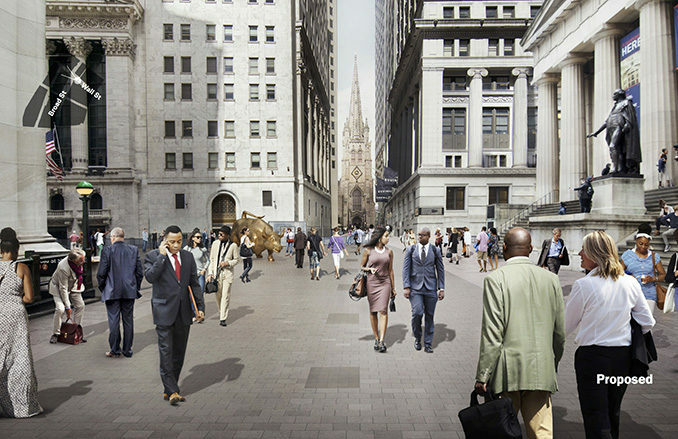 The Alliance has been working with WXY Architecture + Urban Design, with support from Sam Schwartz Engineering, SCAPE and City Activators incorporating public feedback, as well as guidance from an ad hoc committee of over 30 stakeholders. Creating curbless shared streets and using more uniform, durable, and historically appropriate paving materials throughout the district. Installing custom “gateway” structures at the main pedestrian entrances to the district to give people a sense of arrival in a special area. 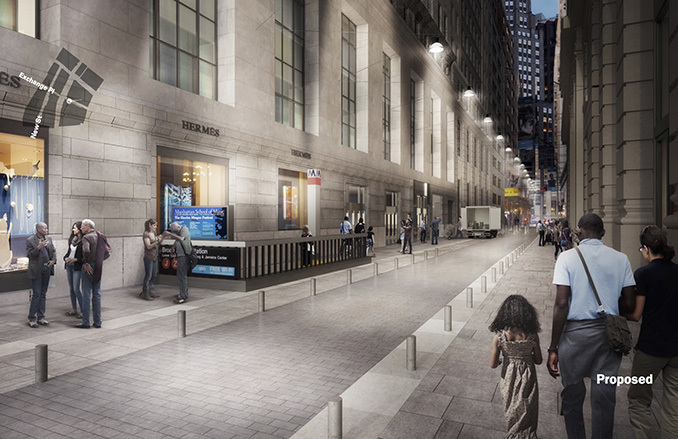 Upgrading lighting along dark corridors, particularly New Street and Exchange Place, with cable or cantilevered lighting, while framing the area’s nine landmarked buildings with architectural lighting. 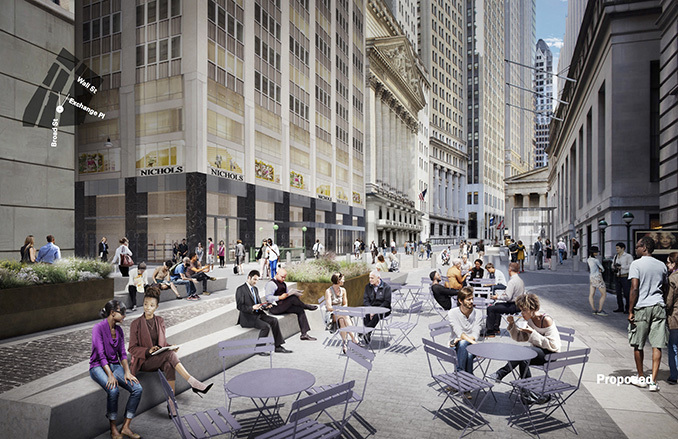 Expanding pedestrian access on Broadway and creating more sidewalk space on New Street by redesigning the street in a way that adds loading bays and gets trucks off the sidewalks. Adding new multi-functional seating areas that include planting beds. Decluttering security infrastructure with more attractive bollards. Piloting a consolidated delivery center for all packages arriving in the district. 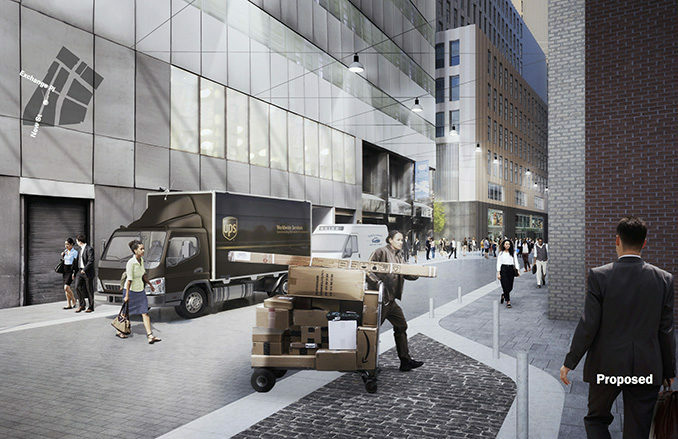 This pilot would create a centralized delivery truck drop-off point and then disseminate packages within the area by hand-truck or small vehicles. 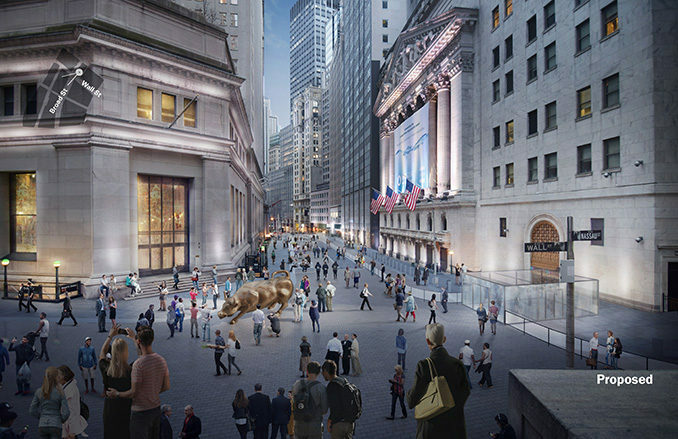 The plan works within security parameters established by the NYPD, and is designed to be realistic with changes that can be implemented in stages, over several years, by both public and private sector actors. Given the high level of real estate activity in recent years — six properties have changed hands, five buildings have undergone, or are in the process of residential conversion and hundreds of millions are being invested by private owners — this is an opportune moment for the community to work with the city and individual owners on a well-needed transformation of the area.